Stand on the platform in her showroom with a wedding dress on, look into the generous mirror Gemma has provided, and enjoy the transformation from everyday to the vision you have become. It’s amazing how truly exquisite I felt when I put on the dress Gemma altered for me! Her encouraging words talked me right into a much needed boost, as I had chosen a dress form Deseret Industries that was marked down drastically! I had paid $25.00 for a ” wedding dress and train” that were in sad need of dry cleaning.Some of the loops in the back of the dress were in broken. Gemma needed to upgrade the clasps on the train, and repair the loops. The dress was backless, and too big. I needed a fitting for an ensemble that would become her masterpiece. Her artist’s eye and talented expertise transformed my purchase into the gift I needed to see myself in the vision she was creating. She and her sister painstakingly sewed on the extra embellishments and brought the back of it into a modest creation of harmony and balance, and that was time consuming. She was enthusiastic and inspirational. When she was satisfied with her work I asked her what my twenty five dollar purchase would be worth if it was on the market and she told me twelve hundred dollars! I happily recommend Gemma’s ! Gemma is so awesome! 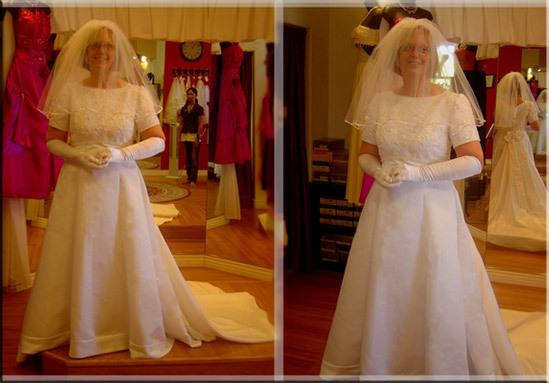 She did a great job altering my bridal gown and bridesmaid dress and I couldn’t have been more pleased. I came back after the wedding and she cut the hemline so I could wear the dress again and again. Her prices are fair and she does a great job – plus she’s super sweet and so is her staff. I wouldn’t hesitate to recommend her to family, friends and fellow brides. Thanks Gemma!